So off we went to the La-Z-Boy store and sure enough they had some really great – albeit expensive stuff – but what the heck this is going to be football heaven. 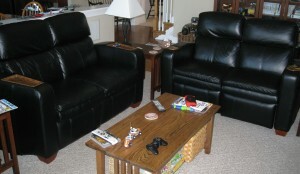 The product is the La-Z-Boy Matinee Home Theater seating. So we ordered the stuff and 2 months later it arrived. Fantastic! The pieces arrived in good shape and right when they said they would arrive. Pretty nice; a great buying experience. Things were great for a couple of weeks but then I started to notice problems. 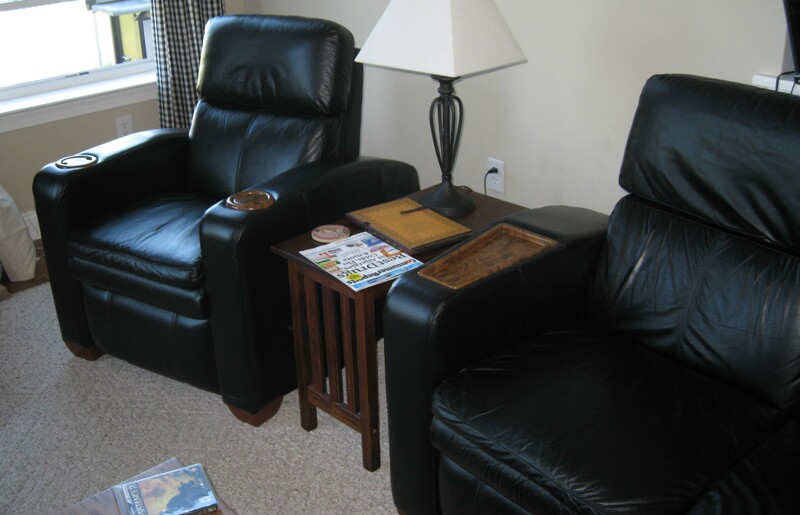 The wedge pieces have armrests – makes sense – so that when you recline there is somewhere to put your elbow. What I noticed was that the place where you put your elbow was starting to push in. Fearing some kind of defect I immediately called La-Z-Boy and demanded a replacement. They agreed and ordered replacement units: no charge and no question! Of course it would take another 4-6 weeks to get the units. So we waited…sure enough the stuff arrived and a technician replaced them. One curious thing was that the guy had to rip the cup trays out (with a screwdriver) and glue them into the new units himself. The guy luckily had a tube of epoxy glue in the van, but he had no way to clamp the trays in. I had to pile paint cans and dumb-bells up on them to hold them down tight while the glue dried overnight. Well – problem resolved I hoped. La-Z-Boy wanted to leave the old pieces here for me to throw away – strange but ok.. I wanted to see why this problem happened anyway – was it bad assembly or something worse. Was it a defect in my pieces or was it a design defect? I did a little dissecting project and what I found was really amazing. The area in question is the wedge piece armrest. See the pic below for the exact location. In my basement I flipped the unit upside down and cut through the felt on the bottom. Straight off I was a bit shocked. The piece is plywood and some bracing. The flat back of the unit is made out of shirt cardboard. I could not see the top because there was a plywood brace across the top. Naturally I was thinking that the plywood was the actual top, but I could not see any signs of damage or movement. Then I decided to cut through the leather on top. What I found just amazed me: the top of the piece is also made out of shirt cardboard – right where your elbow goes. So you have the leather, a thin piece of foam, and then crappy thin cardboard. There is nothing but air supporting that cardboard. Cheap cardboard and there is a gap under it. That’s why it pushes in. That’s just amazing to see I think. One of these pieces is about $1200 USD, so by no means is this a low-end piece of furniture. You can see in this pic that the cardboard comes up the back side and wraps across the place where your arm would rest. Any pressure at all and this will start to sag in – a no brainer conclusion to draw. This is a serious design flaw. It is so bad that it cannot have been made by accident. Any slight testing in the shop would show that this is not going to work. Given La-Z-Boy’s “expertise” in recliner systems this can only be a cost vs. quality gamble that people will not notice until warranties run out. 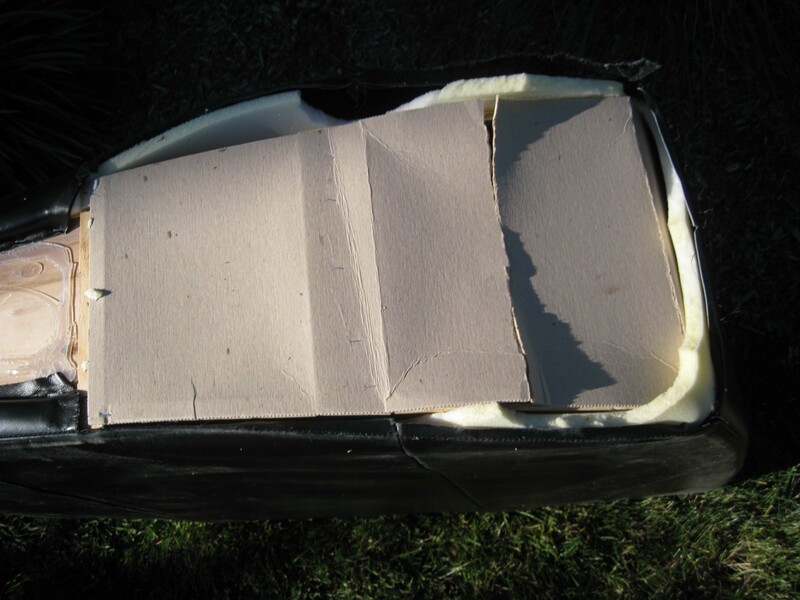 UPDATE (07-Sep-2010): I’ve since learned that it is not just the wedge pieces, but all the armrest pieces that are made out of shirt cardboard. You start seeing the problems first in the larger wedges, but the problem starts to show up in the standard arms too. I’ve gone back and google’d the web and not found too many people mentioning this problem so either I’m the only idiot to buy this junk or other people have not had the furniture long enough to develop the problem. 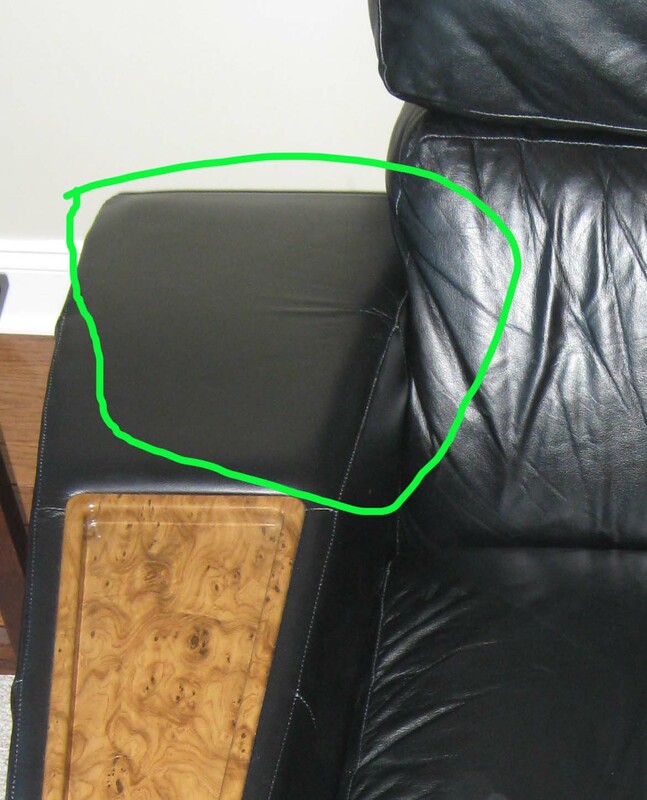 I thought I would at least write this post to give a shout out to people considering this furniture. If you are considering this furniture just go into the store, recline, and lean on your elbow and you will feel the cave in starting. I’m going to give a call into La-Z-Boy and see if I can get my money back. I think this is a design flaw that should either be corrected or I should get my money back. I’ll follow up with their response. UPDATE (10-Jan-2012): Still have the junk in my house…my little 17 pound terrier Pippin is even too much for the arms on these things…sigh…worst buy in my life. UPDATE (13-Oct-2016): Finally we are getting rid of this crap. We’ve ordered a Stickley sectional sofa to replace this junk. All the arms are crushed in and many of the seams are starting to open up. I’ll stick to my opinion that La-Z-Boy is the worst furniture on the market. That you for your comment – I don’t allow advertising…even my own. I’ve edited your comment and removed that part. Obviously I would very much like to avoid encountering an issues relating to poor construction, especially for a product in this price range! Did La-Z-Boy respond to you at all with an acknowledgement that this was a one-off issue and offer some kind of apology or restitution for the whole experience? No they did not – I would say – don’t buy it. It is junk. I even went into the store where I bought it and showed the defect to the sales people. I just moved into a townhouse and wanted something to comfortably watch my big screen tv. This seating is perfect. Very comfortable and very functional. Drink holders and storage inside each wedge for DVDs. I looked at all of the furniture stores in the area and could not find this product and certainly could not find the same value. It shipped in 5 big boxes so it was a little bit of a job to get from the truck to the living room. Also one of the plastic feet on one wedge was busted but it was no problem to get a replacement. This is the ultimate home seating for watching sports and DVDs on a big screen tv. Wrong – I disagree – its crummy terrible stuff. Its great as long as you don’t lean on the arms. Terrible stuff. I’ll never buy anything from La-Z-Boy again. Its great at first – but after a few weeks and months it falls apart. I removed the hyperlink to your advertising spot as well…plus the units you are talking about are not the La-Z-Boy units my post is about. I’ve had my set of 4 (recliners) for 10 years. Have the cloth, not leather but still no wear and tear, great mechanisms working. Glad you’ve had luck with them. Happily I have them out of my house as of this week. If you could get past the arm pieces they were ok, but I think with the leather these pieces are probably much more noticeable than with leather. Happy to say that this stuff is out of our lives. Donated to charity and we have a new couch with quality construction. I’ve had my black leather motorized Lazboy Matinee setup just like this one for over 10 years now and they are all still in excellent shape. No issues with the arm rests. Glad you’ve enjoyed it. Do you have the same wedge pieces? You bought your’s before I did so perhaps they got lazy after you purchased yours. The facts show their furniture is junk – complete junk for the money they are asking. I don’t have a lazy boy, but I bought a couch that has cardboard in the arms. I know it has cardboard because the pop sound it makes when you lean against the side. The couch has barely been used and sags. I was wanting to know if La-Z-Boy was a better, sturdier, quality brand. I thank you very much for your post. This helps me to know not to purchase a La-Z-Boy. I’ve had to deal with the same problem you had with a different brand and don’t want to repeat the problem again. Again thank you for this. You are welcome – glad it helped you.